When I try to be pretentious, I say that beer blogging at its best is also a lens through which we can view history, politics, travel, gastronomy or other aspects of human lives or society. My beer photos tend to be of the optimistic kind, capturing places I am happy to visit, here or abroad. There are other kinds of beer photos, with fog instead of sunlight, with poverty and despair instead of hope. Der Spiegel presents a series of photos from a book by Harald Hauswald. The book, Ferner Osten or The Far East, is a portrait of the last years of the DDR. Grim and powerful images by one of the few photographers in East Germany with access to Kodak film. The Oslo beer scene was given four pages in one of the publications of the Aftenposten newspaper yesterday, with Crowbar prominently featured. It is also available online. Cold and dry weather had been replaced by sleet and snow, and we didn’t really have much on the agenda before returning to the hotel to pick up our baggage. We had some time to spare, but the climatic conditions did not invite to find another cozy old inn at the end of an alley in the Nicolaivirtel. The nearest option was a large establishment decorated in blue and white. The Berlin outpost of the famous Munich Hofbräuhaus, a stone’s throw from the Alexanderplatz at Karl-Liebknecht-Strasse. This is a huge place, very quiet in mid-afternoon. A huge menu, not surprisingly with a pork bias. Eight beers on tap, plus a seasonal if you’re lucky. Staff dressed up in Bavarian costumes, wooden benches and tables. Taped yodel and polkas when I was there, but there is live music every night. This is probably crammed with stag parties and buses of tourists during hight season. Wikipedia tells me there are dozens of Hofbräu franchises around the globe, the one in Berlin one of the newest. Think McDonalds for adults. And I suppose you are supposed to sing along, at least after midnight. But the beer is good. Better than the standard Berlin beers. And there is outside seating when the weather allows. Don’t miss the souvenir shop. I’m sure many have bought stuff there they have regretted when sobering up. 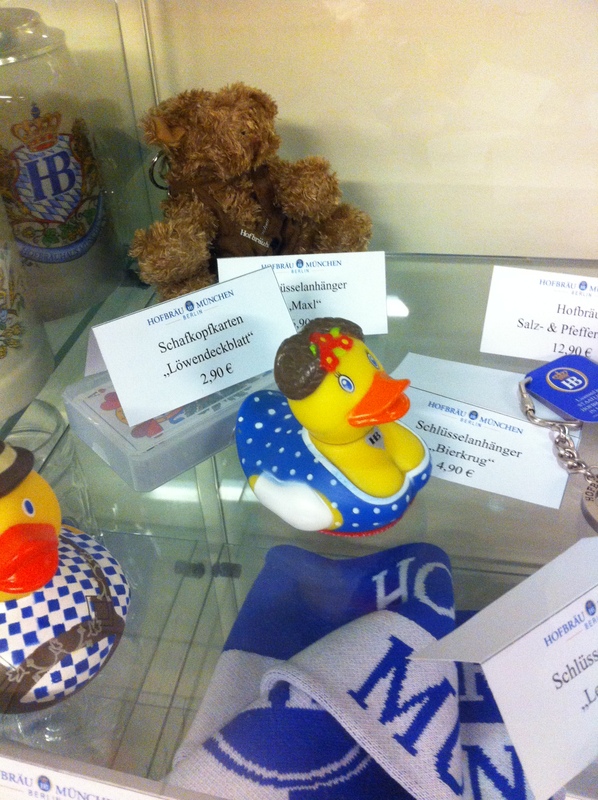 But the rubber ducks in dirndl are awesome.